Oren Lyons is a Faithkeeper of the Turtle Clan of the Onondaga Nation and a Chief of the Onondaga Nation Council of Chiefs of the Six Nations of the Iroquois Confederacy, the Haudenosaunee. He was a founding member in 1977 of the Traditional Circle of Elders and Youth. This council of respected Indian leaders meets annually to provide an avenue for Native American culture to inform and contribute to contemporary cultural and political debate. In 1982 he helped establish the United Nations Working Group on Indigenous Populations and participated in the Indigenous People’s Conference in Geneva, an international forum supported by the UN Human Rights Commission. In 1992 he was invited to address the General Assembly of the United Nations and open the International Year of the World’s Indigenous People at the UN Plaza in New York. During that year he organized a delegation of the Haudenosaunee to attend the UN Conference on Environment and Development in Rio de Janeiro and was invited to address the national delegations. Now retired from teaching, Lyons was Professor of American Studies at the State University of New York-Buffalo, where he directed the Native American Studies Program and taught Native American history. He authored and co-authored many books and articles, including children’s books, and in 1992 edited Exiled in the Land of the Free, which made the case for the influence of the ideas and values of the Iroquois Confederacy on American democracy and the Constitution. He continues to inspire generations through his leadership in the Traditional Circle of Indian Elders and his public speaking. In 2001 he addressed the US Department of Energy’s Tribal Summit. 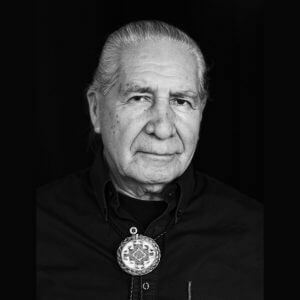 His dedication to the cause of Native and environmental rights has garnered him many accolades, including an honorary degree from his alma mater, Syracuse University. The Rosa Parks Institute for Human Rights and the National Audubon Society have recognized Lyons’s work. In addition, he was named Earth Action’s Goodwill Ambassador for the Earth and was awarded the Ellis Island Medal of Honor. Oren Lyons is the subject of a PBS documentary by Bill Moyers and recently appeared in Eleventh Hour, a documentary on the state of the natural world and climate change, produced by Leonardo DiCaprio.